Midland Railway who gave their lives in the Great War 1914-1919. It was unveiled on Thursday December 15th 1921 at 11.45am, and was located at what was the Headquarters of the Company at Derby. 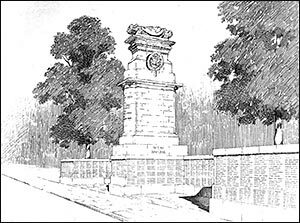 The memorial takes the form of a Cenotaph 31 feet high, which is surmounted by sarcophagus, upon which is laid to rest the figure of a fighting man, and is flanked by wing walls terminated by bastions 10 feet high, and enclosed by low seats. There were 2,833 employees who died. and placed within laurel wreaths in the Midland Company’s coat of arms. On the walls, bastions, and podium, are engraved the names of all the Midland men who gave their lives in the Great Cause, either on land, on the sea, or when engaged in the air service. Not all relatives were invited to the opening, instead a booklet was sent to the relatives. These five are listed as working at Rushden Station. After further research into Rushden War Memorial Men we find that these men also worked on the railway before enlistment in WWI. Creditable as is the above list, it is not exhaustive. Private W Perry, who formerly worked at the Rushden M.R. Station, of the 2nd Suffolk Regiment, is a prisoner of war at Sennelager, Germany. He has written to his friend, Mr H Boyce, acknowledging cigarettes and postcards which Mr Boyce has sent to him. He says he received the parcel quite safely.